HAWAII: State health officials have confirmed two cases of "locally-acquired" dengue fever on Hawaii Island, and are also investigating four more probable cases. image of Aedes aegypti mosquito courtesy the Center for Disease Control and Prevention. HAWAII – State health officials have confirmed two cases of “locally-acquired” dengue fever on Hawaii Island, and are also investigating four more probable cases. Following several news reports, the Hawaii State Department of Health issued a news release on Thursday, and offered additional tips and information on the mosquito-borne illness. HONOLULU – The Hawaii State Department of Health (DOH) is investigating two confirmed and four probable cases of dengue fever in Hawaii residents and visitors that was locally-acquired on the Big Island of Hawaii. Further testing and confirmation at the U.S. Centers for Disease Control and Prevention (CDC) is pending. 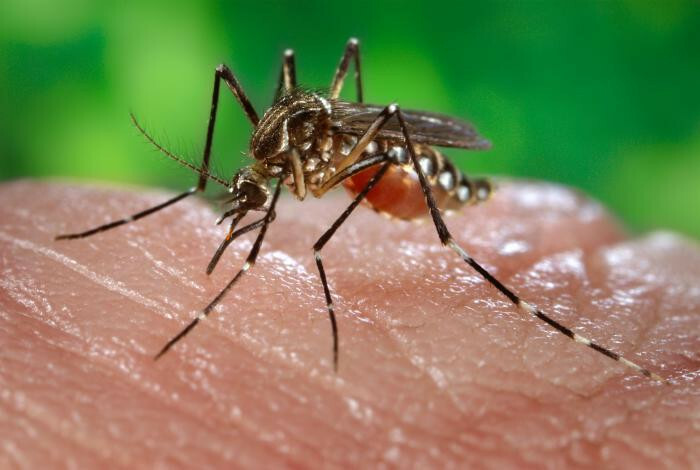 The department sent out a medical advisory to Hawaii County clinicians earlier today to alert them and urge them to report suspect dengue fever cases. Dengue virus is most often transmitted through the bite of an infected mosquito. Travelers to areas with infected mosquitoes where dengue fever is endemic are at the highest risk of acquiring the disease. 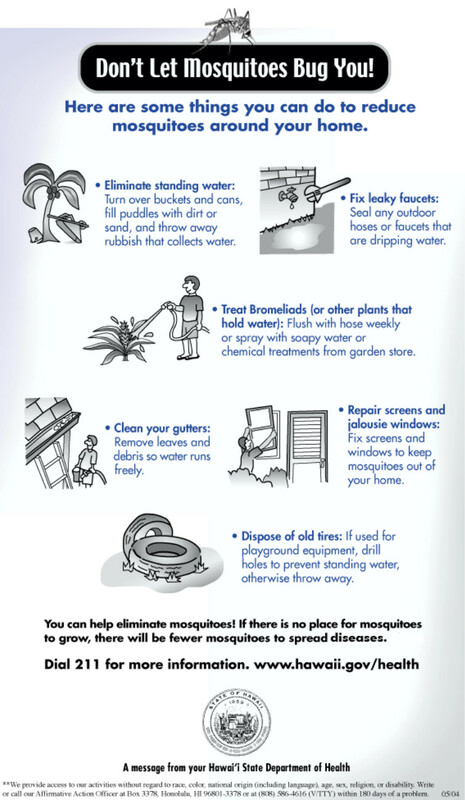 Mosquitoes breed in areas of standing water (such as planters, old tires and pet water bowls). Use mosquito repellents containing 20–30 percent DEET and wear long sleeves and pants in areas where mosquito-borne disease is a concern. Dengue fever is a viral illness spread by mosquitoes. The disease occurs mainly in tropical Asia, Africa, the Caribbean and the South Pacific. It is most common during the rainy season in areas infested with infected mosquitoes. Sometimes, persons arriving from other countries may enter the United States with dengue fever and infect local mosquitoes, as happened in Hawaii in 2001. The symptoms of dengue fever include sudden onset of fever, severe headaches, eye, joint, and muscle pain, and rash. The rash typically appears on the hands, arms, legs and feet 3 to 4 days after the fever begins. Minor bleeding problems can also occur. The symptoms usually go away completely within 1 to 2 weeks. Sometimes, people with dengue fever have blood clotting problems. When this happens, the illness is called dengue hemorrhagic fever. Dengue hemorrhagic fever is a very serious illness with abnormal bleeding and very low blood pressure (shock).